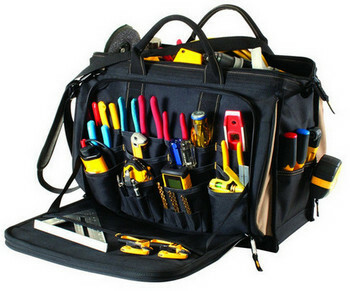 Given the lots of tools an electrician needs in his/her line of duty, a tool bag is something that you cannot afford to avoid having. It helps you to keep all tools and accessories organized, and even better, it assures you of having every tool needed for the job handy. As such, you will never fail to complete a task due to having forgotten some essential tools. Once you decide to purchase a tool bag, getting the best tool bag cannot be easy unless you have an idea of what it takes to get the best one. Moreover, it is ideal to have an idea of some of the brands available as this can help you save some time. For such reasons, we undertook the task of finding the best electrician tool bags to make it easy for you. 1. Number of compartments - What is the nature of tools you carry with you to your line of duty? Are they many or few, large or small? This is a question that you ought to answer before getting a tool bag. If you use a lot of tools, you will need to get a bag with lots of pockets. On the other hand, if your tools are less, a bag will fewer compartments will do the task. Whats more is that if you deal with big tools, you will want to get a bag with at least one or two big compartments to ensure that they can fit in securely. 2. Durability - The secret to getting the best tool bag and one to render service to you for a long time lies in getting a durably built bag. After all, you can imagine that the nature of the tools an electrician deals with are not friendly. Some of the tools feature sharp edges, while others are rough to the touch. As such, you will need to get a bag with materials that will not scratch easily, or get torn due to the sharpness of the tools. So, ensure that you can get a bag with a sturdy material, for instance, a poly fabric material or 1680D ballistic weave. 3. Ease of carrying - A good tools bags should be easy to carry. Therefore, it should include carrying straps to enable you to lift it with a lot of ease. Whats more is that the straps should be padded and adjustable to allow you to carry even the heavy tools with little struggle. If you decide to get a backpack, ensure that it features a padded back, as this will let you stay comfortable even when carrying heavy tools. 4. Price - For you to get the right tool bag, you will need to get that which you will afford without straining your pockets. For you to get an affordable bag, get a bag with the features that need. Remember, the bigger the bag, or the more the number of compartments, the more money you will have to part with. So, only pay for the features that you need and avoid bags with the features that are not a requirement for you. The bags reviewed above are also affordable which is the reason I recommend that you get one of them if you can get that which suits your needs. Now that you about the things you need to look for when buying a Electrician Tool Bag, it's time for the actual reviews. I hope it will be much easier for you to choose one after you are done reading. 50 organizer pockets and a large carabiner and tape-measure clip. A textured, padded, and an adjustable shoulder strap. 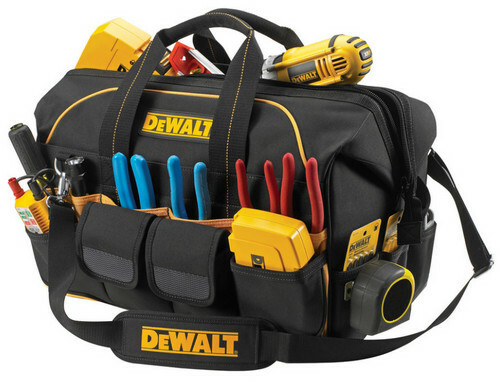 Are you looking for the best tool bag to help you keep your tools organized? With this product, you can be sure to have all your stuff organized in one package. It features 50 pockets that will let you organize all tool and accessories so that you can access them fast during your next project. The bag can hold large hand tools due to the large center compartment that can carry multiple power tools and accessories. Whats more is that it features a large carabiner and tape-measure clip on the exterior that holds the tape measure for easy access. With it, you can have the tools you use on a frequent basis at your fingertips due to the vertical tool pockets and the seven exterior pockets that let you access critical tools fast and effortlessly. The bag is spill proof, thanks to the zippered side panels that prevent the spillage of tools when carrying and storing it. More to that is that it is durable and built to last due to the heavy-duty poly fabric body that lets it withstand a lot of pressure. You can be sure to carry the bag with much ease since it features a textured, padded, and an adjustable shoulder strap that lets you carry it comfortably. Whats more is that it includes padded carrying handles to allow you to lift it with much ease. 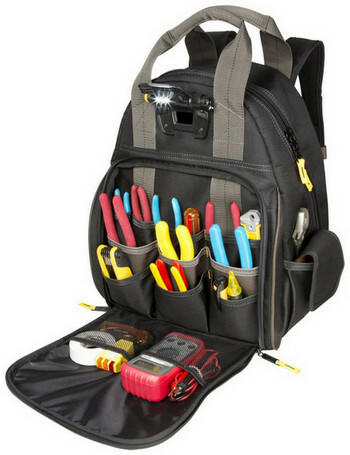 You can get the tool bag for use by electricians, plumbers, carpenters, general maintenance personnel, among other individuals. It measures 18 x 14 x 7 inches and weighs 4.6 pounds. 57 organizer pockets of which 48 are interior while 9 are exterior. Padded feet on the bottom to reduce abrasion and wear. An LED light that emits 39 lumens of light. As one of the best tools bag in our review, this bag will let you hold pliers, wrench sets, testers, extension cords, screwdrivers, and several other tools needed for your project. It features 57 pockets of which 48 are interior while 9 are exterior. As such, you can be sure to have all tools organized and the frequently used tools at a ready-to-access point. Besides having a bag that will let you remain organized, the bag acts to provide you a wide area of illumination so that you can easily see your work area or the backpack for you to identify tools fast. This is due to the included LED light that can easily be directed to the workplace or into the backpack. The light can emit 39 lumens of light while getting its power from 2AAA batteries. Once you want to carry this bag, you can be sure to do so comfortably, thanks to the padded web carrying handles and adjustable shoulder straps. The bag also includes large pads on the back to assure you of a back comfort when you carry it. Whats more is that it includes padded feet on the bottom that aid in reducing abrasion while reducing wearing to increase the life of the tool bag. A laptop pocket, hard molded front pocket, and several inner compartments. Tough, durable molded bottom reduces wear and abrasion. Padded and adjustable shoulder straps enhance comfort. Do you look forward to taking your laptop with you along with your tools? 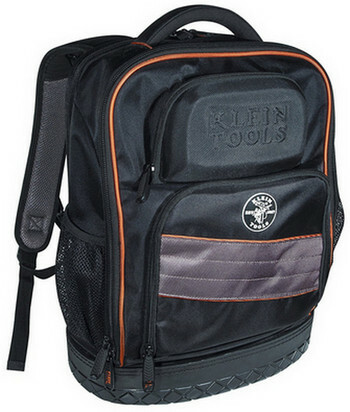 If so, the Klein tools backpack makes a perfect choice. It features a separate compartment that will let you keep your laptop protected from tools thereby allowing you to take it along with the tools. The laptop pocket can fit laptops of up to 3" thick. Besides this pocket, it includes a hard molded front pocket that allows you to store glasses and other fragile items without having to worry about them breaking. Whats more are inner compartments that let you organize a variety of tools needed for construction jobs. 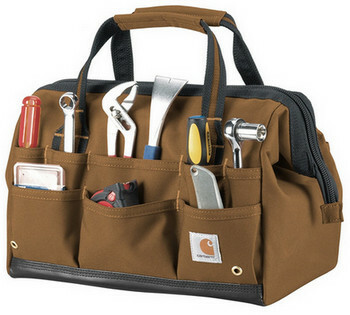 This makes the tool bag ideal for use by contractors, technicians, among other tradespersons. You can get the bag with an assurance that it will last for an extended period, and that it will withstand much weight. Thanks to the tough, durable molded bottom that acts to protect it from elements. The bag features an orange interior that allows you to have a clear view of the tools at all times. It includes padded and adjustable shoulder straps that let you carry even heavy tools comfortably. More to that is a padded carry handle to allow you to lift it with much ease. The bag measures 19.2 x 16 x 8.1 inches and weighs 5.4 pounds. Sturdy synthetic fabric with a rain defender to maintain dry tools. 17 exterior pockets and 10 interior pockets. Rugged and comfortable grip handles. Triple needle-stitch construction enhances durability. Featured as one of the best tool bags in our review, you will fall in love with this bag due to its durability and ability to let you stay organized. The bag is built of sturdy synthetic fabric with a rain defender so that your tools can remain clean and dry at all times. It is available in a variety of sizes all with different numbers of pockets, making it ideal for use by DIYers and job site professionals. You can get the bag in one of the three sizes available that is the 18", 16" and 14" bags. The 18" bag features 28 exterior pockets and 16 interior pockets. On the other hand, the 16" bag features 23 exterior pockets and 11 interior pockets. The 14" bag features 17 exterior pockets and 10 interior pockets. This means that you can be sure to get a bag of the right size based on your profession. The 18" and 16" bags are ideal for carrying heavier loads due to the abrasion-resistant molded base that can support heavy tools and gear. Whats more is that all bags feature an internal metal frame that allows you to access your tools without having to worry about the bag collapsing on itself. The bag includes YKK zippers that prevent the tools from spilling when stored or when on the move. It includes rugged and comfortable grip handles to enhance your comfort when carrying. The bag is built to last due to the triple needle-stitch construction that allows it to withstand a lot of weight without tearing. 53 pockets including 28 tool pockets, 14 accessory pockets, and 11 multi-use pockets. A large base pad feet that aids in reducing wear and abrasion. Carrying handles and adjustable padded shoulder straps. A built-in LED light powered by 2AAA batteries. Featuring a built-in LED light powered by 2AAA batteries, this is the perfect bag to purchase when you need to complete your projects ahead of schedule. The light can be directed to the work area or tool bag allowing you to handle projects even when in a low lit area. Whats more is that it features three levels of light output, thereby allowing you to adjust for a wide area of illumination. The bag comes with 53 pockets that make self-organization an easy task. It features 28 tool pockets, 14 accessory pockets, and 11 multi-use pockets. With these, you can be sure to have your favorite tools and accessories in an easy-to-access point. Whats more is that the bag features dual compartments. These assure you of remaining organized and able to find your tools easily when working on a deadline. Additionally, the bag includes two cinch straps for use with a cordless driver/ drill and battery charger. Hence, you can be sure to have all your needs catered for once you get one of these. The tool bag features a durable construction and large base pad feet that aids in reducing wear and abrasion. Moreover, it features carrying handles and adjustable padded shoulder straps that allow you to carry all tools needed for the job with a lot of comfort and ease. Three external pockets and an expansive interior storage. 600Denier weatherproof polyester fabric enhances durability. Two thick strap handles and a dual zipper system. Are you a DIYer or a contractor looking forward to getting the best tool bag to organize your tools? If so, you might want to purchase one of these. The bag features three external pockets and an expansive interior storage to allow you to keep your accessories safe and within reach. It features a durable construction where it includes a 600Denier weatherproof polyester fabric. As such, you can be sure to have your tools safe when stored in wet or dry conditions. Whats more is that it is reinforced with industrial quality Bartec stitching. As such, you will never have to worry due to wear or tear or the need to constantly repair torn or loose parts. The tool bag comes with two thick strap handles connected with a cross X stitching. 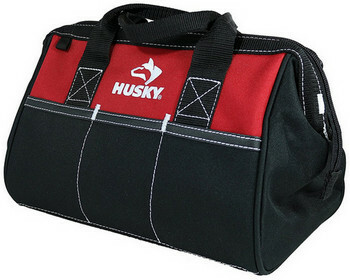 This makes it a tough bag and one to carry heavy tools with a lot of ease. Moreover, it features a dual zipper system to avoid spillage of tools when on the move or when the bag is stored. The tool bag measures 12 x 7 x 9.5 inches and weighs 1.2 pounds. You can also get the bag as the 15" bag or 24" bag depending on the tools you want to carry. 25 pockets and sleeves to organize a wide range of tools. An adjustable padded shoulder strap featuring an air mesh padding to enhance comfort. A rugged and lightweight 600Denier polyester fabric. 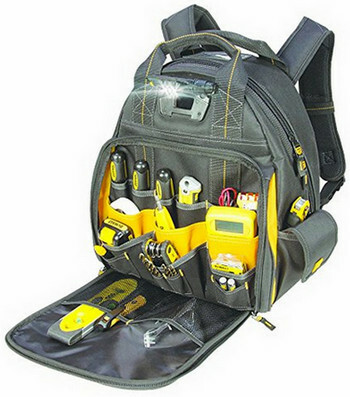 As one of the best tool bags, this bag makes a perfect choice for use by electricians, maintenance workers, technicians, among other personnel who want to keep their tools close. The bag features a combination of 25 pockets and sleeves to allow you to organize a wide range of tools. Whats more is that it includes a zippered top flap that helps to secure tools that are not in use. With it, you can be sure to protect your tools from spilling when moving around the job area or once you store the tools. The tool bag provides a convenient spot to hold the hammer and electrical tape. Thanks to the hammer holder and electrical tape loop featured on it. With it, you can be sure to carry even heavy tools with much ease. 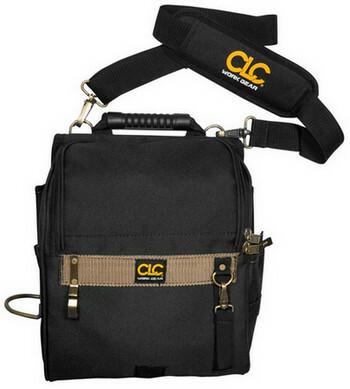 This is due to the adjustable padded shoulder strap that provides convenience when carrying. Even better, the shoulder strap features an air mesh padding that helps to reduce heat build-up to assure you of comfort every time you carry the bag. The tool bag also includes a soft grip rubber handle that keeps your hands comfortable when lifting it. Once you get it, you can be sure to get a durable yet lightweight tools bad due to the featured double layer of the rugged and lightweight 600Denier polyester fabric. The tool bag measures 12.2 x 4 x 14.5 inches and weighs 2.6 pounds. Having read the article above, I believe that you will have an easy time determining the best electrician tool bag that is worth your money. I recommend that you give a try to some of the reviewed bags if you can get one that will fully meet your needs by paying attention to the buyer's guide.